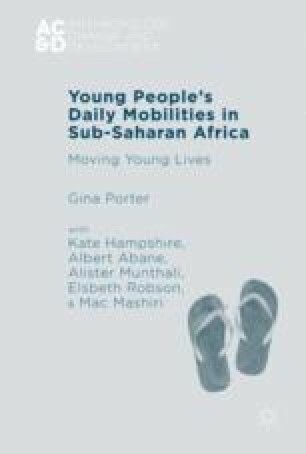 This chapter introduces the field studies on which the book is based and traces the development of the mixed-method, child-centred approach to mobilities research, embedded in participant observation and culminating in the Child Mobility (CM) study in 24 sites. The incorporation of peer-investigation by young people themselves, working with academics as co-researchers, is discussed in some detail. A review of field methods, their benefits and disadvantages, follows: this includes experiments with a mobile interview method, focus groups, life histories and a substantial quantitative survey—all designed to elicit specific information, but set within an ongoing close engagement with the study communities concerned. Attention to the ethics of working with young people, both as co-investigators and respondents, is a linking theme. The chapter concludes with information about some of the individual field sites where research has been conducted and the logic behind their selection.